, an ingenious French mathematician and philosopher, was born at Pau, in the province of Gascony, in 1636; his faiher being a counsellor of the parliament of that city. At the age of sixteen he entered into the order of Jesuits, and made so great proficiency in his studies, that he taught polite literature, and composed many pieces in prose and v< rse with considerable delicacy of thought and style before he was well arrived at the age of manhood. Propriety and elegance of language appear to have been his first pursuits, lor which purpose he studied the belles lettres; but afterwards he devoted himself to mathematical and philosophical studies, and read, with due attention, the most valuable authors, ancient and modern, in those sciences. By such assiduity in a short time he made himself master of the Peripatetic and Cartesian philosophy, and taught them both with great reputation. Notwithstanding he embraced Cartesianism, yet he affected to be rather an inventor in philosophy himself. In this spirit he sometimes advanced very bold opinions in natural philosophy, which met with opposers, who charged him with starting absurdities: but he was ingenious enough to give his notions a plausible turn, so as to clear them seemingly from contradictions. 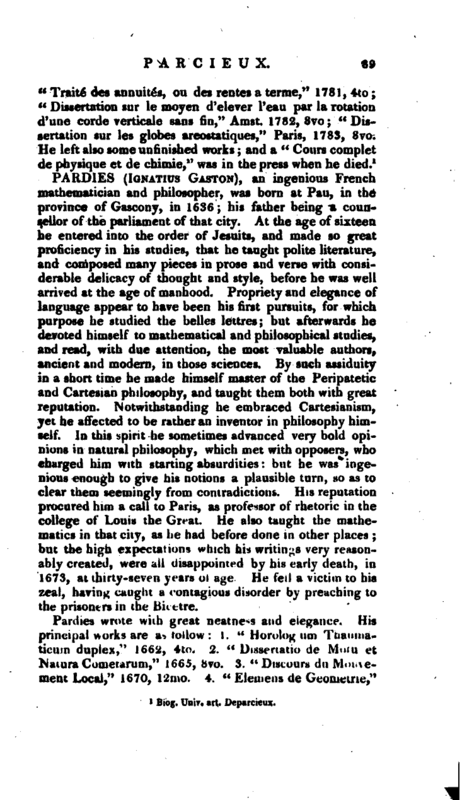 His reputation procured him a call to Paris, as professor of rhetoric in the college of Louis the Great. He also taught the mathematics in that city, as he had before done in other places; but the high expectations which his writings very reasonably created, were all disappointed by his early death, in 1673, at thirty-seven years of age. He fell a victim to his zeal, having caught a contagious disorder by preaching to the prisoners in the Bicetre. 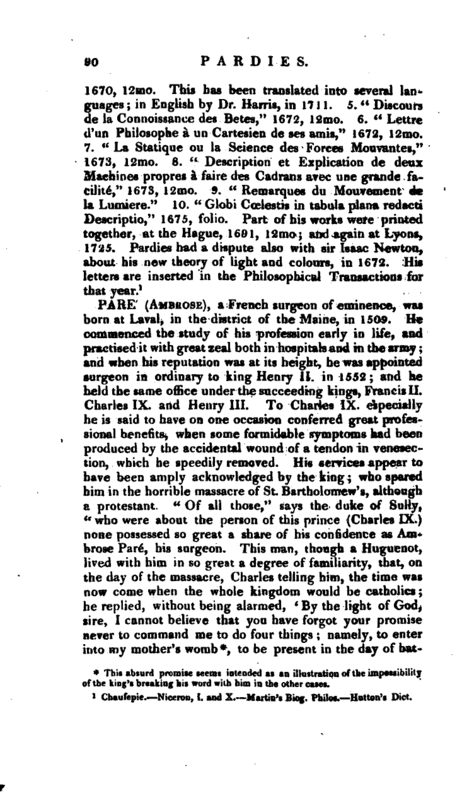 Chaufepie.—Niceron, I. and X Martin’s Biog. Philos. —Hutton’s Dict.